Among the latest flock of Android Wear smartwatches lie some real beauties, but most of them are going to cost you a pretty penny. Not so much the ZTE Quartz: the company's first swing at Wear is all about affordability, and although that means some compromises, it still offers the Android Wear 2.0 experience along with a data connection, for $192, undercutting many of its data-connected rivals. This is a smartwatch that's vying for a different audience than most of the 'Phase 2' Android Wear 2.0 lot, which have either crammed in as many features as possible or focused heavily on design. The Quartz does neither; ZTE has made a wearable it believes will appeal to first-time smartwatch buyers or just those looking for something more affordable. Which is what the Chinese company has always been about - affordability. ZTE has made a name for itself in budget smartphones, but can it win us over with its first Android Wear smartwatch? That, friends, is the reason you're here. To me, the Quartz is neither good looking nor hideous, but each to their own taste. 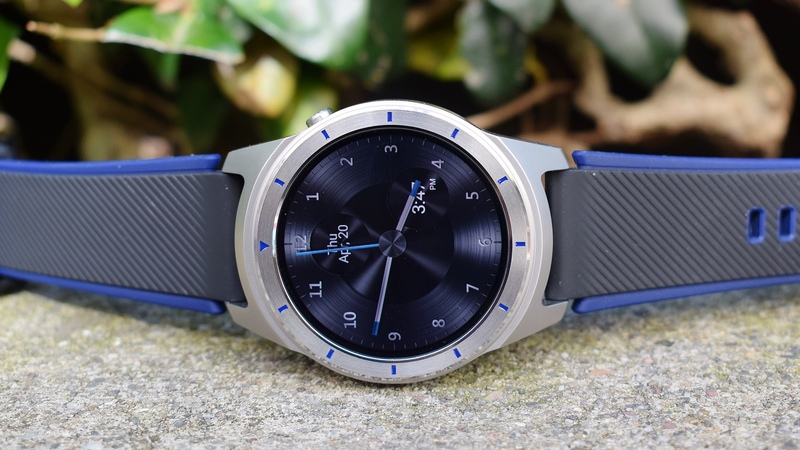 Lug to lug it's just a tiny bit taller than the LG Watch Sport, but rather than conceal its heft in a sporty look akin to LG's device or the Huawei Watch 2 it opts for a stainless steel case complete with tachymeter - although that's only there for show. Flip it over and it's got a plastic back that's visible side-on, which feels a little at odds with the stainless steel, but also makes it more comfortable for running with. With a 46mm diameter and 14.5mm thickness it's also a chunky beast, but the 1.4-inch AMOLED display and 400 x 400 resolution it also can't be accused of lacking vibrancy. On the right side of the case you'll find a single button at the 2 o'clock mark for accessing the Android Wear menu, but you'll be using the touchscreen to get around beyond that. Again, it's about the bare minimum. I've been using the Samsung Gear S3 and LG Watch Sport a lot these last few weeks, and I have to say, going back to a smartwatch without rotational input feels like a little step back. But I appreciate those devices are in the minority right now, and for first-time smartwatch buyers it's probably not one of their concerns. And it's those first-time buyers that ZTE wants to hook in. This isn't a bad looking smartwatch; it's just a little uninspiring. But the display is nice and wide (no flat tyre, but that should be expected by now) and the build quality feels sturdy. The watch comes with a black and blue silicone band and ZTE says it's not too interested in accessories, but you can swap in any standard 22mm strap of your choosing. As I said earlier, ZTE has compromised to get the Quartz to its price point. It doesn't come with a heart rate monitor, which may be a dealbreaker for a lot of people, but GPS does make it in, and with Wear 2.0 and cellular you can certainly make it a fitness companion. You now have standalone apps from the likes of Strava and Runkeeper that will let you leave the phone at home and still be able to use the Quartz to track your distance and pace, but you won't get the heart rate information from the watch alone. There's also 4GB of storage space inside the watch for loading music onto, should you want to head out for a run without your smartphone. Then we have the cellular connectivity. ZTE has joined forces with T-Mobile for this, and that's why the watch can only be bought from the network's store. Also, bear in mind that while the watch itself is $192, you'll need to pay for the data on top of that. If you're an existing T-Mobile customer you can get on the wearable $5/month plan (and share the number across both phone and watch) but otherwise you'll be looking at more. Cellular is a welcome feature although the Quartz only supports bands for 3G (HSPA/GSM), not it's not quite as fast as LTE which you'll find on some other Android Wear watches right now. During testing I found my connection was nice and reliable, and yes, while slower, it was fast enough for getting prompt responses from Google Assistant or quickly scouring some restaurant reviews for somewhere to eat nearby. The omission of NFC is more irksome. I've harped on about this plenty, but if Android Pay wants a shot at becoming ubiquitous then I think Google needs to enforce NFC as standard in all Android Wear devices. As for the Quartz, you won't be able to use your wrist to pay. ZTE said it dropped NFC to make shave off 0.22mm of thickness, but I'd have preferred it hadn't. Back to the GPS briefly, and I've found this to be decent, though sometimes it veers off a tad, adding extra distance to my runs. On one run, which you can see below on the left, it added 0.15 miles onto my total from going slightly off-course a couple of times. That's compared to my smartphone GPS which was running alongside separately, and while not perfect, better kept me aligned to the pavements, but it hasn't proven to be disastrous by any stretch. When I spoke to Jeff Yee, ZTE's VP of technology planning and partnerships, I asked him why ZTE decided to jump in now with Android Wear and not sooner. The simple answer was Google Assistant. I haven't yet been won over by Assistant on the smartwatch but ZTE apparently has, and Yee said he believes voice interaction is going to be key to the Android Wear 2.0 experience. This is why cellular made the cut when more commonplace features like a heart rate sensor didn't. Some smartwatches, like the Huawei Watch 2, have added a few custom extras to the Wear 2.0 experience, but ZTE has kept its hands off the software, meaning you're essentially getting the stock experience. It's also silky smooth. The Quartz has the same Qualcomm Snapdragon Wear 2100 chipset as the LG Watch Sport - which we found to have a frictionless experience - and the same 768 MB of RAM. Moving around the OS is zippy and I've had barely any problems with lag. It all just works as I'd want it to. However, as I mentioned before, you only have one button on the side to open and close the app menu, while everything else is done on the touchscreen. The upside of its massive form is the large display, which means your digits don't obstruct quite as much when you're prodding the screen. Still, another shortcut button for assigning apps to would have been nice. ZTE came in boasting hard about its 500mAh battery, which edges out the Samsung Gear S3 and the Sport. The Quartz can eek out 40 hours with a few power compromises, but for how you'll most likely use it, expect the touted "all day". That's what I've found in testing, with the Quartz getting me from 8am to the evening on most days before I pop it onto its charging dock for a replenish. That's with the always-on display live, a bit of cellular activity, and notifications flowing in throughout the day. If you want to get closer to the 40 hour mark, you'll want to disable at least the first two of those things. When using GPS I found that battery obviously took more of a hit, but with one run in a day I could still make it stretch until the evening. ZTE has always been about affordability, and doesn't deviate in the Quartz. For people looking to buy their first smartwatch, the low price tag makes it a compelling offer, even if it lacks NFC and a heart rate monitor. There are definitely better looking and more feature-packed watches out there, but for this price? It might prove to be enough for some folks, especially those making their first smartwatch buy. Let's just hope Google Assistant proves as much of a hit as ZTE is banking on.